Recently on QuantStart we've discussed machine learning, forecasting, backtesting design and backtesting implementation. We are now going to combine all of these previous tools to backtest a financial forecasting algorithm for the S&P500 US stock market index by trading on the SPY ETF. This article will build heavily on the software we have already developed in the articles mentioned above, including the object-oriented backtesting engine and the forecasting signal generator. The nature of object-oriented programming means that the code we write subsequently can be kept short as the "heavy lifting" is carried out on classes we have already developed. Mature Python libraries such as matplotlib, pandas and scikit-learn also reduce the necessity to write boilerplate code or come up with our own implementations of well known algorithms. The forecasting strategy itself is based on a machine learning technique known as a quadratic discriminant analyser, which is closely related to a linear discriminant analyser. 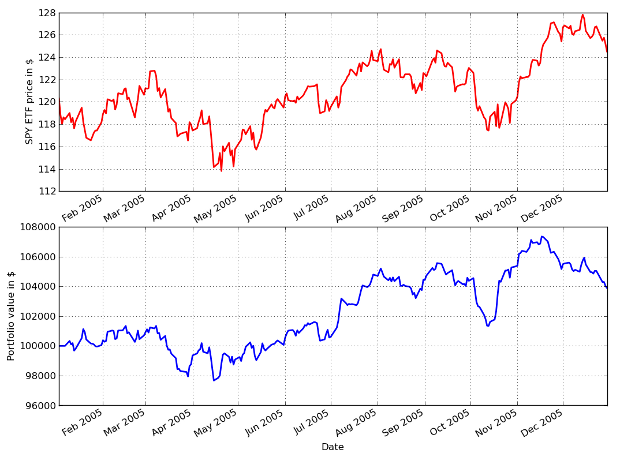 Both of these models are described in detail within the article on forecasting of financial time series. The forecaster uses the previous two daily returns as a set of factors to predict todays direction of the stock market. If the probability of the day being "up" exceeds 50%, the strategy purchases 500 shares of the SPY ETF and sells it at the end of the day. if the probability of a down day exceeds 50%, the strategy sells 500 shares of the SPY ETF and then buys back at the close. Thus it is our first example of an intraday trading strategy. Note that this is not a particularly realistic trading strategy! We are unlikely to ever achieve an opening or closing price due to many factors such as excessive opening volatility, order routing by the brokerage and potential liquidity issues around the open/close. In addition we have not included transaction costs. These would likely be a substantial percentage of the returns as there is a round-trip trade carried out every day. Thus our forecaster needs to be relatively accurate at predicting daily returns, otherwise transaction costs will eat all of our trading returns. Once all of the relevant libraries and modules have been included it is time to subclass the Strategy abstract base class, as we have carried out in previous tutorials. SNPForecastingStrategy is designed to fit a Quadratic Discriminant Analyser to the S&P500 stock index as a means of predicting its future value. The fitting of the model is carried out in the fit_model method below, while the actual signals are generated from the generate_signals method. This matches the interface of a Strategy class. bars - A DataFrame of bars for the above symbol.""" US stock market index (^GPSC in Yahoo).""" Now that the forecasting engine has produced the signals, we can create a MarketIntradayPortfolio. This portfolio object differs from the example given in the Moving Average Crossover backtest article as it carries out trading on an intraday basis. The portfolio is designed to "go long" (buy) 500 shares of SPY at the opening price if the signal states that an up-day will occur and then sell at the close. Conversely, the portfolio is designed "go short" (sell) 500 shares of SPY if the signal states that a down-day will occur and subsequently close out at the closing price. To achieve this the price difference between the market open and market close prices are determined every day, leading to a calculation of daily profit on the 500 shares bought or sold. This then leads naturally to an equity curve by cumulatively summing up the profit/loss for each day. It also has the benefit of allowing us to calculate profit/loss statistics for each day. out the trade at the close of the bar. provided by the 'signals' DataFrame.""" the equity curve and the percentage returns.""" The final step is to tie the Strategy and Portfolio objects together with a __main__ function. The function obtains the data for the SPY instrument and then creates the signal generating strategy on the S&P500 index itself. This is provided by the ^GSPC ticker. Then a MarketIntradayPortfolio is generated with an initial capital of 100,000 USD (as in previous tutorials). Finally, the returns are calculated and the equity curve is plotted. Note how little code is required at this stage because all of the heavy computation is carried out in the Strategy and Portfolio subclasses. This makes it extremely straightforward to create new trading strategies and test them rapidly for use in the "strategy pipeline". The output of the program is given below. In this period the stock market returned 4% (assuming a fully invested buy and hold strategy), while the algorithm itself also returned 4%. Note that transaction costs (such as commission fees) have not been added to this backtesting system. Since the strategy carries out a round-trip trade once per day, these fees are likely to significantly curtail the returns. In subsequent articles we will add realistic transaction costs, utilise additional forecasting engines, determine performance metrics and provide portfolio optimisation tools.